An active-use layer for vital core warmth, enhanced breathability, and stretch mobility, the Arc’teryx Atom LT Hoodie features hybrid construction with Coreloft insulation and Polartec Power Stretch side panels. 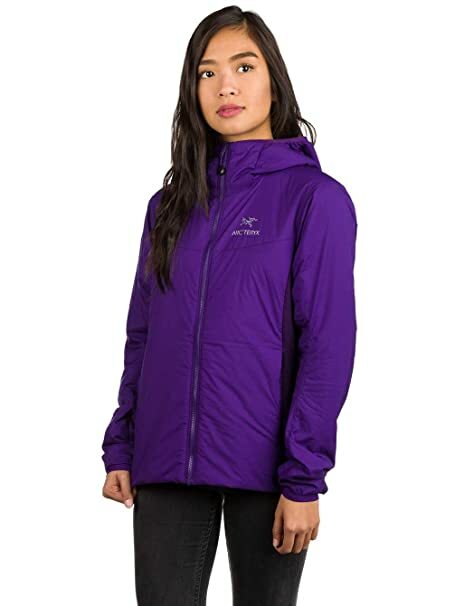 A great lightweight and breathable layering piece, the womens insulated Atom LT Hoody from Arc’teryx is ideal as a stand-alone in fair weather as well. 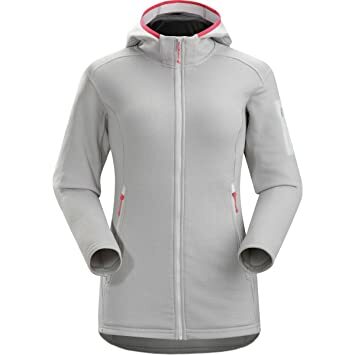 Exterior is wind and moisture resistant with mobility-enhancing stretch panels at the sides and underarms. Coreloft synthetic insulation fills the torso, arms and hood. Non-locking zippers enable easy, one hand operation.Breathable.Insulated.Lightweight.Compressible and packable.Wind resistant.Composite construction.Breathable, stretch side panels for enhanced comfort and mobility.Articulated elbows.Gusseted underarms.Trim fit for base layer or light mid-layer use.Hip length.ScubaHood.Insulated, helmet compatible StormHood.Full front zip with wind flap.Stretch-knit cuffs.Drop back hem.Adjustable hem drawcord.Laminated hem.Internal chest pocket.Two hand pockets.Machine washable.Average weight(M): 11.6 oz (330 g). Strategic placement of synthetic and down insulation has Coreloft™ synthetic insulation, that retains warmth when wet, placed along the collar and shoulders – areas prone to contact with moisture. 850 fill European white goose down lines the core where warmth is most needed.DWR finish repels moisture so don’t be afraid of being caught in light precipitation.Streamlined and lightweight, the Cerium LT vest is filled with 850 grey goose down and is intended as a mid layer or standalone piece in cool, dry conditions.Specialized construction: light, elasticized hem; binding finishes and superior craftsmanship are the thoughtful attention to detail that allows the use of stronger fabrics that can stand up to everyday use.Down done differently – Minimalist design for maximum performance, built to the highest levels of craftsmanship, with innovations for increased range of comfort and conditions. Efficient, lightweight and durable enough to wear every day. High warmth-to-weight ratio. Conforms closely to the body trapping heat closer to your core. Highly compressible.These trim fitting garments share motion-friendly traits with our Athletic fit, but are patterned with lower volume for reduced bulk. Our trim fit is sized for a base layer and a trim synthetic or down filled mid-layer.Materials: Coreloft™ 100 (100 g/m2 ) insulation. Made with highly crimped multi-denier siliconized polyester yarn, this lightweight, breathable, and thermally efficient, 100 polyester staple fiber is very compressible and has excellent loft retention. Airetica™-100 nylon, 34 g/m2. Tightly constructed, high tenacity, 20×10 denier ripstop nylon with a smooth hand. 850 fill European white goose down. 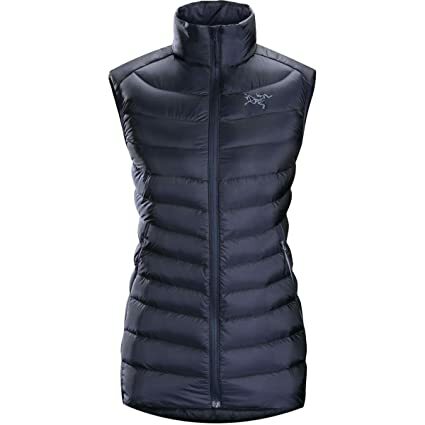 DECENT FEATURES of the Arcteryx Women’s Beta AR Jacket e3D anatomical patterning and fit for unrestricted movement WaterTight Vislon centre front zip Two hand pockets with laminated WaterTight zippers Internal laminated pocket with zippers Laminated WaterTight pit zips The SPECS Weight: M: 14.1 oz / 398 g Fit: Athletic with e3D, hip length Fabric: N70p Gore-Tex Pro 3L This product can only be shipped within the United States. Please don’t hate us. Though Arc’teryx named it after a radioactive element with a half-life of 10. 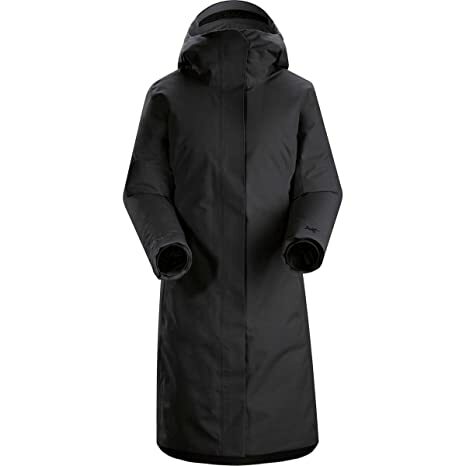 45 million years, the Women’s Thorium AR Hooded Down Jacket isn’t, thank goodness, radioactive; however, it does slow your decay in cold weather to give you an outdoor half-life longer than 10. 45 seconds. Crafted with a combination of 750-fill European goose down and selectively-situated synthetic insulation, this jacket keeps you warm whether you wear it on its lonesome during your chilly backpacking trips or under a hardshell whilst perusing some secret powder stashes. Down is a mix of feathers and clusters that work cooperatively to create insulating air pockets, trapping warmth and preventing cold air from passing. The Thorium’s synthetic insulation works the same way, creating an air-pocket barricade, but with one substantial difference: wet down is dead down, which means you’ll go down quickly from the cold. 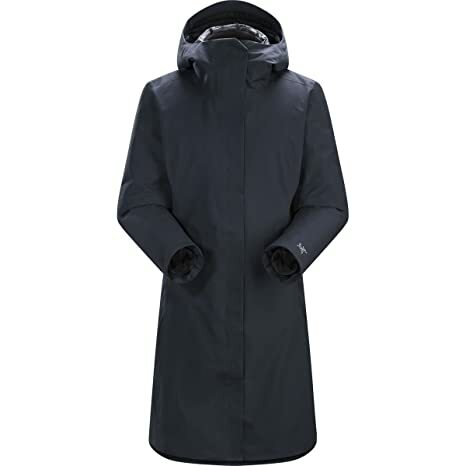 By utilizing synthetic insulation in strategically placed inserts, this jacket is inherently water-resistant and dries quickly when wet. 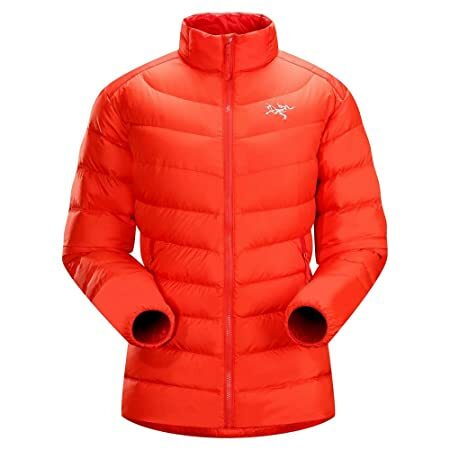 So it’s no surprise that Arc’teryx placed the synthetic insulation in areas which bear the brunt of exposure to moisture–the shoulders, hood, and neck-gaiter area. 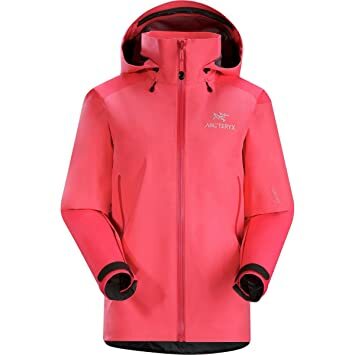 Technical bells and whistles are fun, but when it’s all said and done, you want a down jacket that will handle the rigors of daily abuse–precisely why Arc’teryx opts for ripstop Colibri with a DWR treatment as the face fabric. So whether you hike year-round, ski in and out of bounds, or schlep from the dorm to class on inclement days when your fellow classmates bury themselves in bed, the Thorium AR hoodie is there. 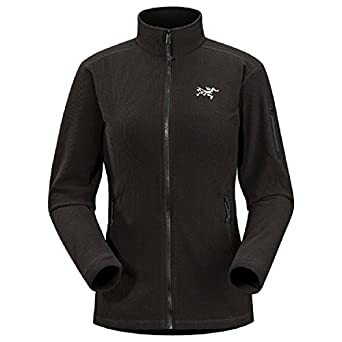 One of the most versatile fleece jackets Arc_Tteryx has ever designed, the Delta LT provides effective warmth for little weight and layers easily under a hardshell. Made from PolartecAr Classic 100 micro velour small grid, the Delta LT is highly air permeable, dries quickly, and packs to a compact size. As a standalone, the jacket adds light insulation most suitable for higher output in cool conditions or cuts a summer evening temperature drop. Under a shell, it works as a lightweight midlayer.